Figure 2 Alignment of the amino acid sequences surrounding the T-loop of insulin and growth-factor-stimulated AGC kinases. 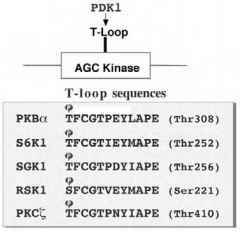 isoforms [55,56], conventional and related PKC isoforms [57-60], PKA , and the non-AGC Ste20 family member PAK1 —were also proposed to be physiological substrates for PDK1, as they could all be phosphorylated by PDK1 at their T-loop residue in vitro or following overexpression of PDK1 in cells. Genetic evidence for the central role that PDK1 plays in mediating the activation of these AGC kinases was obtained from the finding that in PDK1-/- ES cells, isoforms of PKB, S6K, and RSK could not be activated by agonists that switch on these enzymes in wild-type cells . 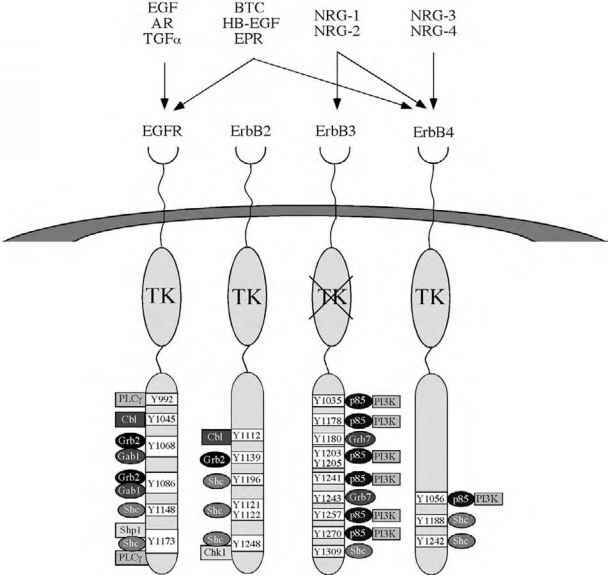 In ES cells lacking PDK1, the intracellular levels of endogenously expressed PKCa, PKCpi, PKCy, PKC5, PKCe, and PRK1 are also vastly reduced compared to wild-type ES cells , consistent with the notion that PDK1 phosphorylation of these enzymes plays an essential role in post-translational stabilization of these kinases [65,66]. The levels of PKCZ were only moderately reduced in the PDK1-/- ES cells and PKCZ in these cells is not phosphorylated at its T-loop residue , providing genetic evidence that PKCZ is a physiological substrate for PDK1. In contrast, PKA was active and phosphorylated at its T-loop in PDK1-/- ES cells, to the same extent as in wild-type ES cells , thus arguing that PDK1 is not rate limiting for the phosphorylation of PKA in ES cells. It is possible that PKA phosphorylates itself at its T-loop residue in vivo, as it has been shown to possess the intrinsic ability to phosphorylate its own T-loop when expressed in bacteria. Thus far, we have no genetic data in PDK1-deficient cells as to whether or not PAK1 is active, but it should be noted that PAK1 can also phosphorylate itself at its T-loop in the presence of Cdc42-GTP or Rac-GTP, stimulating its own activation in the absence of PDK1 .